Have you ever made assumptions about someone based on their language, accent, or skin color? Ever had beliefs or experiences ascribed to you because of your race, ethnic origin, or national identity? 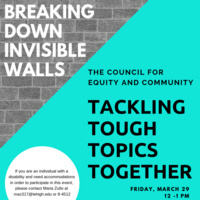 Join us on Friday, March 29, from noon-1 p.m. for a Tackling Tough Topics Together dialogue on “Breaking Down Invisible Walls,” exploring the impacts of these perceptions, questions, and behaviors. Friends’ or strangers’ uninformed questions can make people feel they don’t belong, Lehigh student David Owolabi shared in a recent opinion piece in The Brown and White. Systems of oppression and exclusion create an “inferior other,” Lehigh sociologist Sirry Alang writes in a recent essay. In her TED Talk, novelist Chimamanda Adichie talks about “the danger of a single story” - that in only “knowing” a single story about another person or country we risk critical misunderstanding. Come together to talk about assumptions, misunderstandings, stereotypes, intentions, and impacts as you’ve experienced them and so we can learn from each other. Lunch is provided. All are welcome. The dialogue will take place in the Linderman Library Bayer Galleria, Room 342. If you are an individual with a disability and need accommodations in order to participate in this event, please contact Maria Zullo at maz317@lehigh.edu or (610) 758-4152. Brought to you by the Council for Equity and Community (CEC) Education and Dialogue Working Group.